The doctor will see you now … via your smart phone, tablet or computer screen. While telemedicine may seem like a brand-new way to get medical care, it has been successfully used around the world – and even in outer space – for decades. But as personal technology becomes more capable, so does telemedicine’s ability to conveniently connect medical professionals and patients. And now that so many of us have a small but powerful computer in our pockets or purses, telemedicine is easily accessible to all. 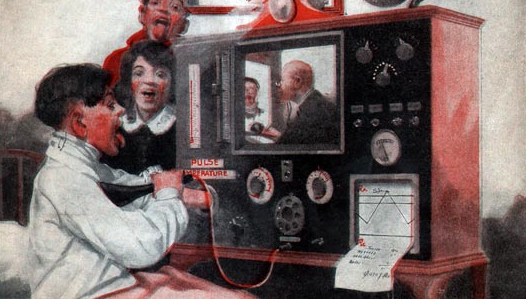 The first recorded use of telemedicine was in 1905, when a Dutch physician, Willem Einthoven, began transmitting data from electrocardiograms via telegraph. 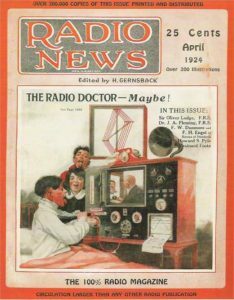 Consultations conducted by radio, for patients who were travelling by sea or located in remote areas, began in the 1920s. The practice was even promoted on the cover of the April 1924 issue of Radio News Magazine, with what was then a wildly futuristic illustration of a doctor consulting with a patient via video. The transmission of radiology images – the images made from x-ray scans – began in the early 1940s, when diagnostic imagery was transmitted via a telephone line from one Pennsylvania town to another located 24 miles away. Medical specialists at the University of Nebraska were regularly doing video consultations with doctors by the early 1960s. In 1967, The University of Miami School of Medicine worked with Miami’s fire rescue department to transmit electrocardiographic readings over a radio to Jackson Memorial Hospital. This enabled doctors at the hospital to provide life-saving care to people on the scenes of disasters, as well as en route to the hospital. The National Aeronautics and Space Administration (NASA) has been deeply involved in telemedicine since the agency’s founding in 1958. Telemedicine remains an important priority for NASA, who continues to explore options for keeping astronauts healthy on the International Space Station. The agency is also vitally interested in finding ways to bring healthcare to astronauts during potential travel to an asteroid or other body in our solar system. NASA is currently focused on developing “smart medical systems” that are designed not simply to communicate and diagnose ill astronauts—but also to provide physicians on the ground with the ability to remotely provide more advanced treatment options. NASA’s discoveries in space will continue to improve our telemedicine capabilities here at home. Telemedicine services replicate the experience you’d have in a doctor’s office as closely as possible, minus many of the annoyances. In the United States, doctors and other health professionals must be licensed to practice in the state you are calling from. Some services offer consultations with local doctors as well. Hands-on exams are obviously not possible (yet!) but you can discuss symptoms via email, phone, computers, video chat, and/or dedicated applications/devices with a licensed health professional. You can also show the doctor any visible indications of illness, such as a rash or swelling. Your remote telemed doctor will also be able to gain valuable information from listening to you speak, cough, etc. When applicable, the doctor may offer treatment recommendations and prescribe medications. Typically, these are short-term prescriptions of non-narcotic medication, though services associated with outpatient care may have different guidelines. In general, telemedicine is best used for simple health issues such as sinus infections, allergies, bronchitis, influenza and severe colds, rashes, bladder and ear infections and similar ailments. A telemedicine consultation can also help you determine if you need to see your own doctor or visit an urgent care clinic or emergency room. Life-threatening issues and anything that requires a physical examination or medical diagnostics testing are not best-suited for telemedicine care. The exceptions would be if someone was in a situation that absolutely precludes access to an emergency room, urgent care clinic, or healthcare provider – e.g. : during a natural disaster, or living/working in an extremely remote area. What Happens During a Telemedicine Consultation? When you first join a telemedicine plan, you’ll be asked to fill out a short form detailing your medical history. Your doctor reviews this before he or she speaks to you. The information you provide is private and secured. Only you and the health professionals you consult with can access your medical history. To request a consultation, you typically use an app on your smartphone, the telemedicine provider’s website, or you call a number provided to you by your plan. You’ll usually be asked for some simple information about why you wish to consult with a doctor – just a few words about your health concern is all that’s needed. The waiting time between requesting a consultation and connecting with the doctor is typically 15 minutes or less. The doctor will ask you some questions, discuss your concerns, and share treatment options. After your consultation, you’ll typically receive a copy of your doctor’s diagnosis and treatment recommendations. If the doctor has prescribed medication, he or she will call it in or electronically send it to the pharmacy of your choice. You can then arrange to pick up your prescription. Many of the dissatisfactions reported with telemedicine are based on people’s personal preferences. They may prefer to see their own primary care physician, or may be uncomfortable discussing health issues with an unknown doctor over the phone or via the internet. That said, a recent study by :DentalPlans found that telemedicine would be far more popular if more people knew what it was and how it worked. Over two-thirds (68%) of survey respondents said that they were unfamiliar with telemedicine. But after reading a brief definition of telemedicine “being able to speak to a healthcare professional by phone or over the Internet … get a diagnosis, advice on managing the issue, and if applicable prescriptions for certain types of non-narcotic drugs” the majority (59%) said that they wanted to try a telemedicine service. 37% of those polled said that they would not (16.7%) or probably would not (20.4%) try telemedicine. Reasons for their disinterest ranged from “prefer to go to my own doctor” (65.4%), quality of care concerns (12.8%), and discomfort with discussing health issues online. Telemedicine costs less, often significantly less, than seeing a doctor in person. Out of pocket healthcare costs are going up. Deductibles – the price a plan member pays before insurance coverage kicks in – rose by 12%in 2016, according to the Kaiser Family Foundation/Health Research & Educational Trust survey. In 2016, the average deductible for employer-provided insurance was $1,478, up from $1,318. At smaller firms, the average deductibles are now above $2,000. For plans purchased on the ACA marketplaces, deductibles are significantly higher. The most popular “Silver” plans have an average deductible of $3,117. Telemedicine plans can help offset the costs of getting medical care. Additionally, telemedicine saves time. Telemedicine patients spend less time waiting for an appointment, and less time stuck in a waiting room. Urgent care clinics: 15 minutes or a few hours. When you factor in commute time to and from the medical facility – and the general annoyance of having to go out in public when you’re sick – it’s easy to see that telemedicine saves significant time and aggravation. American businesses are responding with enthusiasm to these benefits. Telemedicine service offerings among large employers surged to 59% this year from just 30% in 2015, according to the most recent Mercer’s National Survey of Employer-Sponsored Health Plans.